From its institution (against my better judgment) for the 2010 election, early voting has become more and more of a portion of total turnout here in Maryland. In 2010, when it was first adopted, only 11.77% of those who actually voted used the option, with 13.07% of Democrats and 10.13% of Republicans partaking, That number increased to 15.75% of voters in 2012 (18.44% of Democrats, 11.98% Republicans), and – once early voting was expanded from six to eight days – to 17.66% of those who voted in 2014, with 19.86% of Democrats and 15.61% of Republicans using the option. In the last go-round in 2016, however, early voting came into its own: a full 36.02% of Democrat turnout came during early voting, while 24.76% of Republicans who voted used the option. All told, an astounding 31.23% of those who voted did so early. So it was no shock that Democrats “won” early voting once again: according to the Maryland Board of Elections, 16.72% of eligible voters came out for the eight days of early voting. (19.08% were Democrats, 15.44% were from the GOP.) While this is less than the 22.48% that came out in 2016, bear in mind turnout isn’t nearly as good in a midterm election. The all-important question, though, is what percentage of overall turnout is represented by early voting. In 2014 just under 50% of Republicans waited until Election Day to vote (49.6% to be exact) but only 37.5% of Democrats voted on Election Day. If the 2014 numbers hold true, though, turnout for Democrats will be over 10% better than the last gubernatorial election, which was for an open seat, as former Governor Martin O’Malley was term-limited, but the GOP will counter much of that increase with a stratospheric 65% turnout of their own. The question, therefore, is whether those extra 10% of Democrats are going to be loyal to Democrat gubernatorial candidate Ben Jealous or not – he basically needs them all to be to drive incumbent Larry Hogan’s numbers among Democrats down to the 20% or so he needs in order to defeat Hogan – despite polls that have had Jealous down double-digits all summer. As evidence of just how early voting may affect the races, I put together a series of charts. The first one is a straight comparison of raw vote totals from the 2016 early voting and the 2018 version, divided by county and by party. It wasn’t worth comparing to 2014 because its totals were blown away just a few days into early voting and the 2016 election provides a better guide for both turnout and proportion of early voters. The number at the bottom is a comparison of percentages of voters – Democrats were 26.13% off their 2016 totals, while Republicans were only 19.2% off and all the others were 32.55% off. In no instance did the 2018 total surpass a 2016 total, as can be expected – however, Somerset County Republicans finished just 7 voters short of matching 2016 turnout. That’s most likely good news for incumbent Delegate Charles Otto. So then I broke it down by county. Rather than do all the counties, I’m just doing top and bottom 6 in terms of how they matched up 2018 vs. 2016. The higher the number (the proportion of turnout in 2018 vs. that of 2016), the more excited the electorate is. As you can see, there are some counties where turnout looks to be really, really good and others where it may be so-so – in particular, the Capital Region seems to be taking a beating while the Eastern Shore looked like they were ready from the word go. It’s telling to me, though, that traditionally Republican counties are leading the way for the Democrats while their strongholds lag behind – perhaps it’s the way for the minority to express a message? But in those same Democratic strongholds Republicans aren’t coming out, either. Could they be believing the re-election of Hogan is a fait accompli and don’t see the purpose of voting in down-ticket races, or are they simply being traditional Republicans who wait until Election Day? You may notice some counties have more on the Democrat side and others are looking good for the GOP. I tabulated these differences as well as the decline when it came to independents and unaffiliated voters, which have the steepest dropoff from 2016. The color on the right-hand chart is that of the party which led the county in percentage, as shown in the left-hand chart. So on blue counties it’s the difference between Republicans and the “others” and on red ones it’s Democrats vs. the unaffiliated and minor parties voters. Independent and unaffiliated voters were mixed in turnout: those representing “other” parties (holdovers from the previously-recognized Reform and Constitution parties, for example) led with 12.25% of 32,885 voters, but only 9.06% of the 9,164 Greens and 7.73% of the 21,713 Libertarians made it out. There were 10.66% of the 708,012 voters who list as unaffiliated at early voting, and they make up the bulk of the statistics. I know it’s a lot of charts, but we can read a couple things into these, anyway. The other key point is that Republican voters outside the scope of the state’s two largest media markets (Baltimore and Washington, D.C.) seem to see this election as once again “the most important of their lives” and they are coming out accordingly. They are also reacting to downballot races – note the top three GOP counties (and two of the Democrats’ top six) are embroiled in perhaps the most heated State Senate race in Maryland, as I have frequently documented. On the other hand, lower turnout and enthusiasm in Democrat areas has to be worrisome to the state party, which has essentially abandoned its nominee Ben Jealous and appears to be concentrating on maintaining its hold on a State Senate majority that can override Larry Hogan’s vetoes. Their advantage in their regard is that none of their targeted State Senators are in traditional Democratic areas – in fact, ten of their number received free rides this year so they need only win half of the others plus one to maintain their vetoproof hold. Republicans also have a couple vulnerable seats they have to work hard to keep thanks to unaffiliated challengers and primary upsets. But the real fun begins Tuesday. Those who voted early may be pleased to know that the forecast is for rain for most of the state, with the potential for severe weather. (Locally we are looking at just warm but cloudy.) Regardless, grab your umbrella and head out to the polls if you haven’t already. Last night I took a picture of my dining room table. 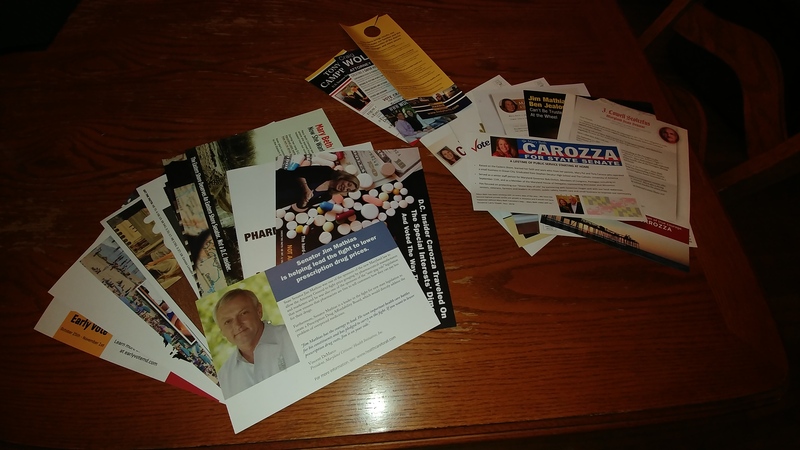 In this photo – with the exception of the Campbell and Wolf items that I picked up – are all the mailings and dropoffs I’ve had so far this campaign. Over the last five weeks I have collected a blizzard of stuff. On the left is the pile for Jim Mathias and on the right the stack for GOP candidates. mainly Mary Beth Carozza. One thing I have found out is that the Maryland Democrats really care about me voting. There are 15 mailings in that left-hand stack, all but one from the Maryland Democratic Senate caucus. Twelve of them have been from the caucus on behalf of Jim Mathias, and they have followed an interesting, perhaps focus-grouped pattern. So here is the pot calling the kettle black, at least in terms of special interest money. While MBC took travel with a value described as “nearly $7,000” in mailing number 8, a look at Maryland campaign finance records shows that Mathias has easily exceeded that figure from Big Pharma over the last four years – something I noted here. I might add this was before his most recent report that pushed him into five figures. As I mentioned, there were 15 mailings on Jim’s behalf. Two of them came from the Senate Democrats with the intended purpose of boosting turnout – the first urged me to have a voting plan (I already did) and the second listed my “public voting record.” (Which, by the way, is spotless over the last four cycles.) As they warn, “Your voting record will be updated publicly after November, 2018.” Go right ahead and be my guest, folks. But for the average low-information voter that may have an unchecked space or two, nothing like a little intimidation from the “mobs” side of the ledger, eh? (MCHI president Vincent) DeMarco said the nonprofit organization spent about $40,000 on the mailings, which were reported as independent expenditures to the Maryland State Board of Elections. Divided by three endangered Senators, that’s over $13,000 more in help for Mathias. It also puts into perspective how much the Senate Democrats are throwing into this race – figuring $40,000 for every three mailings means they are closing in on a $200,000 investment and given the amount of taxing power at stake that $200,000 is probably chump change in their eyes. All told I wouldn’t be surprised there’s over a half-million dollars spent trying to prop up Jim Mathias and save his Senate seat for the special interests. He played a key role in the enactment of Maryland’s life-saving tobacco tax increase of 2007, alcohol tax increase of 2011, and Firearm Safety Act of 2013, and anti-price gouging law for prescription drug prices of 2017 and is working to guarantee health care for all Marylanders. It’s not session in Annapolis without seeing DeMarco lobbying for a higher tax on tobacco. Yes, MCHI is all for higher taxes, O’Malley gun restrictions, and more tax money thrown down the rathole of socialized medicine. As for the price-gouging law, it was one of those that was close to making my 2017 mAP but ended up on the cutting room floor. It was watered down to some extent going through the MGA, but if that’s your chosen featured bill you should know both Mathias and MBC favored it – they just chose to reward Jim with more campaign cash. What MCHI is really after, though, is a bill that would force pharmaceutical companies to justify price increases deemed too steep. It may sound good, but taken from their business standpoint it would place a lot of their trade secrets at risk. MCHI’s justification for a previous version of their bill conceded that, “While the bill does not directly decrease the price of drugs, it is a first step on the path to lower, fair, and justifiable drug pricing.” No, it’s a first step to further clearing the market of small, innovative companies that may need to increase prices to cover development costs. Perhaps that’s why Big Pharma likes Jim so much – they just don’t seem to have the juice for MBC anymore. Maybe she wasn’t useful to them? It should be noted that the Maryland Republican Party has done the heavy lifting to back MBC, and while they are (rightly) critical of Jim’s tax-and-spend voting record, they are really trying to pin a particular bill sponsorship on him – the infamous “Overdose and Infectious Disease Prevention Supervised Drug Consumption Facility Program” known as Senate Bill 288. Jim must have known it was bad news because he was for it before he was against it. This bill, though, was an extension of a 2016 needle exchange bill (SB97) that Mathias voted for and MBC opposed. Even earlier, Mathias voted for a measure eliminating a “one for one” restriction on a long-standing Baltimore City needle exchange program. 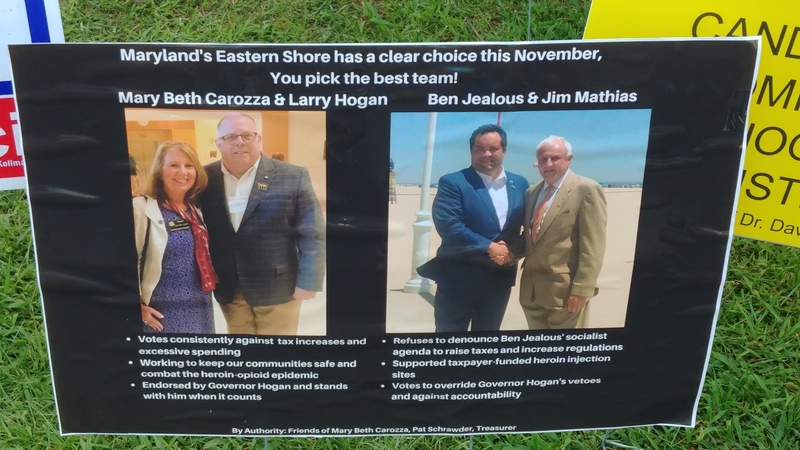 Moreso than the record, though, the MDGOP is using the endorsements of three noted individuals and a photo Mathias probably wishes he never stood for. Then again, Jim’s voting record would make Ben Jealous proud. I’ve stayed out of State elections since my retirement in 2011 but I feel obligated to make an exception because of a recent negative mailing by the Senate Democrat Caucus in support of Jim Mathias. The mailing ridiculed Mary Beth Carozza as a “Washington insider” and labeled her negatively because she has worked for the federal government. Here’s what they didn’t tell you. Stoltzfus goes on to relate that MBC was on the job at the Pentagon on 9/11, and conducted herself in such an exemplary manner after American Airlines Flight 77 crashed into the building that she received the Secretary of Defense’s Medal for Outstanding Public Service. Out of the five mailers I’ve received on MBC’s behalf, 2 1/2 were positive toward her and 2 1/2 negative toward Jim Mathias – well, more specifically, his voting record and/or tying him to locally unpopular Democrats like Ben Jealous or Martin O’Malley. That’s a stark contrast to the Mathias side having 10 out of 12 mailers be negative toward his opponent, with only a few referring to specific votes. They’re obviously hoping voters fail to understand there’s a bit of a difference between being a Congressional staffer and an Executive branch appointee, the latter of which is much of what comprises the Swamp. MBC did a little of both, but more of the time was spent working in Congress and not being a holdover of the previous administration causing headaches for the new boss. To be so negative at this late juncture most likely means the incumbent (or, to be more candid, his special-interest backers) are worried. They have only one more recourse, and it’s going to be interesting to see if they fire that last bullet in the chamber before it’s all said and done. I know one thing, if nothing else: Annapolis Democrats are all about maintaining power by whatever means necessary, principles be damned. So I won’t be surprised if there’s one more special mailing from the Mike Miller swamp in Annapolis. As I have often done, I’ll allow the pictures to tell most of the story – at least until the speeches begin. 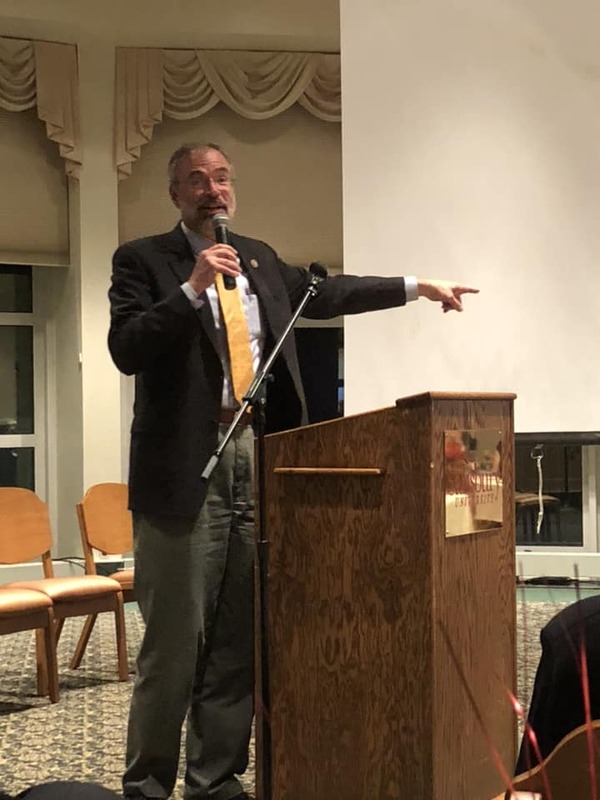 On Saturday night, a cautiously optimistic Wicomico County Republican Party welcomed our two federal candidates to its fold for its annual Lincoln Day dinner: our current Congressman Andy Harris and a man who hopes to join him on the Senate side of Congress, Tony Campbell. But there were some other noteworthy things to relate as well, so I’ll begin with this picture. 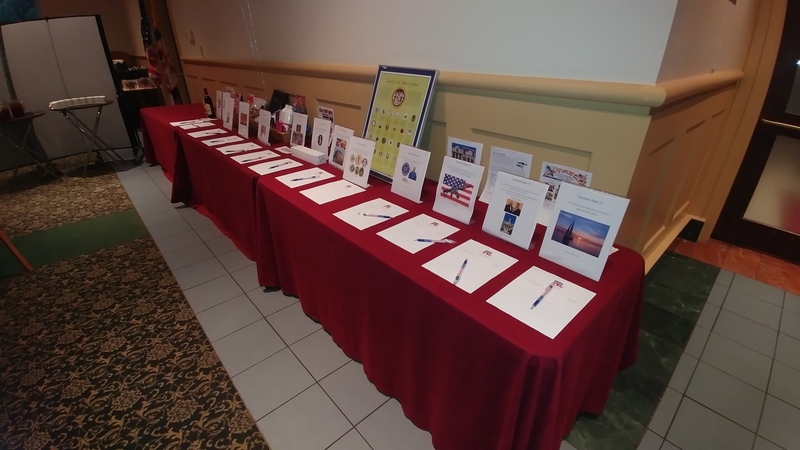 There were 15 items in this silent auction, with many of them featuring experiences with various local officials. The take was well into four figures from what I saw. Portrayed as an irregular detachment of a Maryland company, this band provided a musical backdrop – and a bit of controversy. 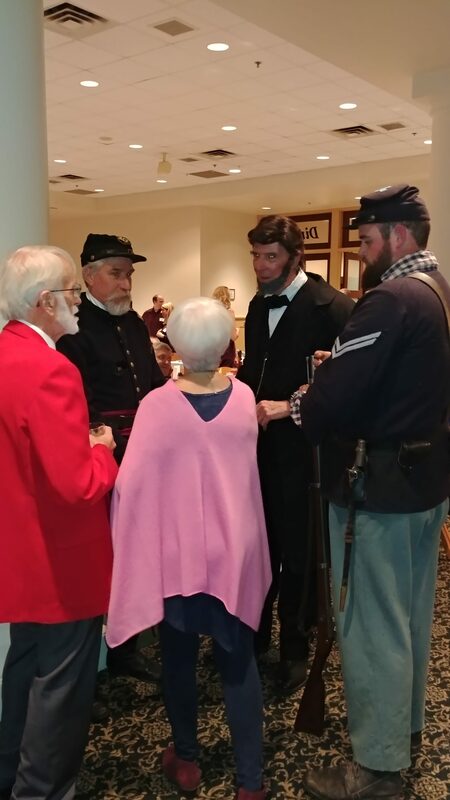 Flanked by two members of his Honor Guard, our sixteenth President, as portrayed by Dr. Art North, catches up with Dave Parker in his trademark red blazer and State Sen. Addie Eckardt in her traditional pink, both with back to camera. 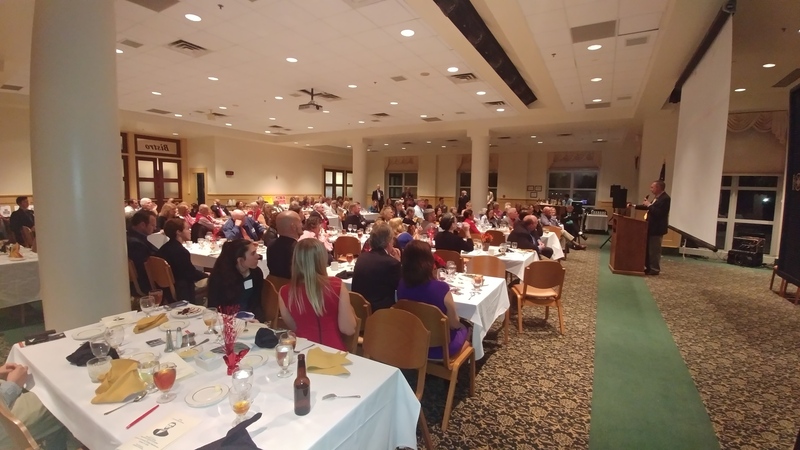 It’s also worth pointing out that, besides the silent auction there was an envelope raffle (place $5 or $10 in the envelope and if drawn you win 10 times the amount) and a 50-50 raffle to benefit the co-hosting Salisbury University College Republicans. So a lot of money was changing hands. In his remarks, Lincoln conceded that “the nation has taken a downhill course” in recent years, as “incivility is the new norm.” Cautioning the gathering not to betray tradition and values, Lincoln stressed the importance of his Cabinet being comprised of the most able men, not yes men. As part of this narrative I also want to give a shout out to one of our two Volunteers of the Year, a young man who eventually closed out the evening with his benediction. Nate Sansom was one of two selected as Volunteers of the Year, with the other being Joan Gentile. 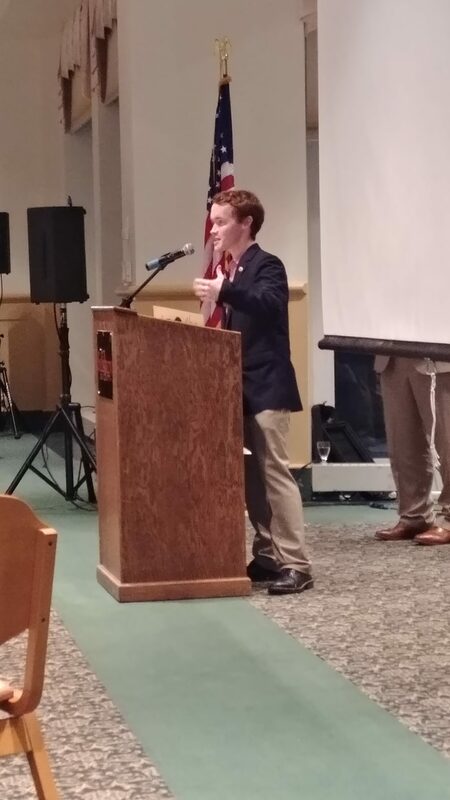 Nate Sansom holds a special place with me because he’s the one I recommended to fill my spot when I left the WCRCC in 2016, and not just because to our knowledge he’d be the youngest CC member in state history: it was because I knew he’d be an asset to the committee. (I’d like to think his selection was out of respect to my wishes.) But because he wasn’t one of the top 9 contestants in the Central Committee’s election back in June, his tenure comes to an end when the final results are in next month. One of his legacies: the state GOP now officially favors a system where each Congressional district controls one Presidential electoral vote with only two at-large, similar to Maine and Nebraska but with ten electoral votes at stake, which would make it the largest such state. Yet somehow I don’t think Nate has reached the limits of his political achievement. Perhaps someday he will be a successor to our main speaker. 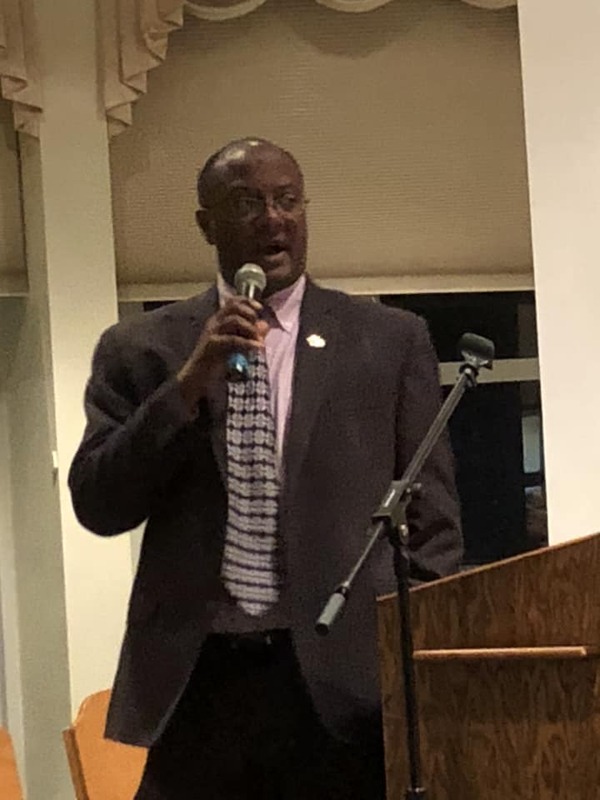 U.S. Senate candidate Tony Campbell was our first main speaker. Photo by Wendy Anspacher. Republican U.S. Senate candidate Tony Campbell is, according to conventional wisdom, the latest cannon fodder for a Senate seat that’s been held by Democrats for seven consecutive terms (five for former Sen. Paul Sarbanes and two by Ben Cardin) and is being sought for the second time in a row by a (different) politically unknown but well-funded unaffiliated challenger. But Tony saw it differently. Telling us that the Democrats were still trying to find themselves, Campbell predicted that Republicans will be elected on November 6 and it will result in “a whole bunch of gnashing of teeth by Maryland Democrats.” As evidence, he noted the increased early voting numbers in strongly Republican counties. Campbell criticized Democrats by stating, “I would hope our elected officials have ethics,” and, referring to the uproar they caused over Brett Kavanaugh’s SCOTUS nomination, told the group that Christina Ford is simply “collateral damage” to the Democrats. To that end, the human caravan in Mexico “is all about the midterms.” Democrats, he continued, don’t care about people, they care only about power. To counter this, Republicans “just have to be bold,” but we have to make a commitment to principles. “We can win and be conservatives” in Maryland, said Tony. But hanging over this was the specter of race. “I knew when I got into this I would be called an Oreo,” said Campbell. 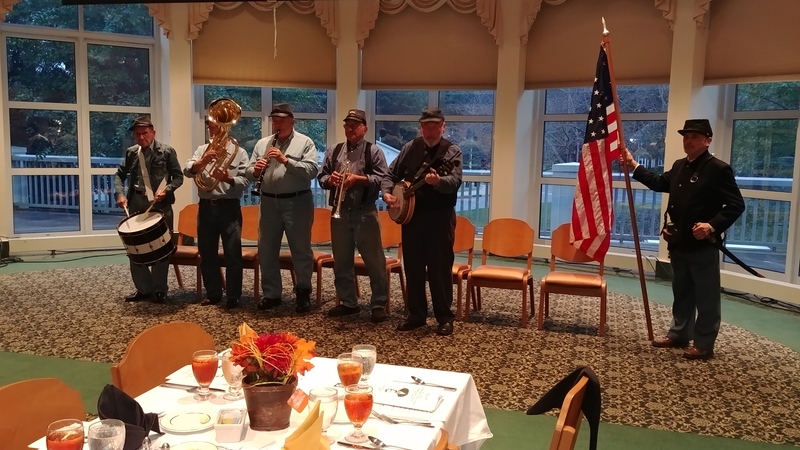 Noting that the band played Lincoln’s “favorite song” Dixie on his exit, Campbell felt he needed to speak the truth and tell us, while it may be historically accurate (and it is), playing that song sends a bad message to minority voters. However, it should be pointed out that, aside from the two districts which are majority-minority, Maryland’s Congressional delegation (nine of ten of whom are Democrats) are all white males while the two non-incumbent Democrats (including the guy challenging our next speaker) are also. Compare that to Maryland Republicans having two women (including one woman of color) in the running for Congress as well as “minority” candidates in the two majority-minority districts (both are white) and the black man running for Senate and ask yourself: if diversity is your thing, which party is the more diverse? Our Congressman Andy Harris wrapped up the night. I don’t think he was pointing at me. Photo by Wendy Anspacher. While it was important to Andy Harris that we elect Republicans, he had a clear request for us: the next time he runs for re-election he wanted Wicomico County to be a Republican county in terms of voter registration: since they elect Republicans they may as well come home to the party. He added that if Larry Hogan wins re-election and brings in five new Republican state senators, the redistricting map they draw will likely allow for three Republicans in Maryland’s Congressional delegation. He also had a job in mind for Larry Hogan once he vacates the governor’s chair in 2022: “Larry Hogan can beat Chris Van Hollen any day of the week,” predicted Harris. Turning to the First District and his opponent, Harris saw him as soft on the Second Amendment, which was a core tenet of this district, Additionally, Andy opined that the state and national Democrats have left the First District Democrats behind in their rush to move in an even more leftward direction. It was beginning to work until the Democrats “overplayed their hand” with the Kavanaugh saga: for example, the Beto O’Rourke vs. Ted Cruz Senate race in Texas was a toss-up before the Kavanaugh confirmation, but now Cruz has opened up a significant lead. Andy Harris speaks, people listen. In conclusion, Andy urged his fellow Republicans to vote for their party up and down the ballot and encourage others to do the same. In case you can’t read this, the verse being referred to is 1 Peter 5:7. Humble yourselves therefore under the mighty hand of God, that he may exalt you in due time: Casting all your care unto him; for he careth for you. It appears someone at Salisbury University has a serious Bible study going on. 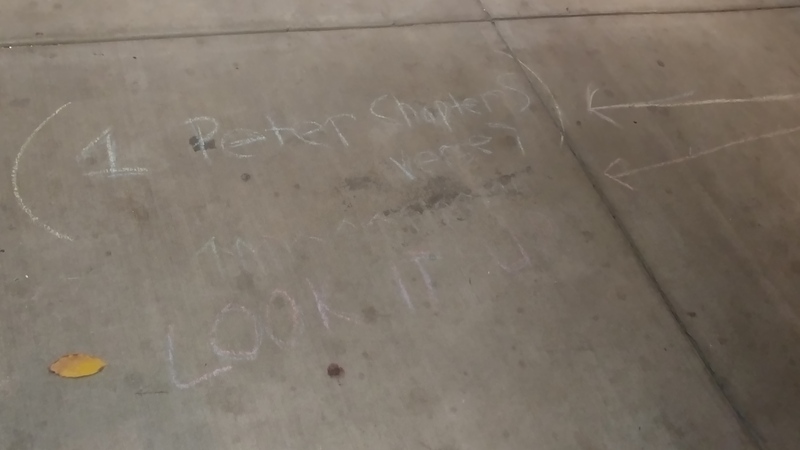 Considering I sat amidst several of the College Republicans and this was still on the sidewalk, maybe there’s hope for us yet. Late edit: Need to get up to speed? Here are parts one, two, and three. Turning to this year’s session, one conclusion is inescapable: the last four years have been a steadier and steadier test of wills between a governor who is trying to promote a particular agenda and a state majority party that had its apple cart upset and is being begged by the special interests that control it to put those apples back and bring back the regular order of things where everyone was fat and happy except the private-sector working families and taxpayers. We’re at the point now where political victories are more important than improving the citizens’ lot, on both sides of the aisle. In 2018, Mary Beth got just 12 votes correct out of 25, although she stumbled into the twelfth by changing her incorrect vote on HB1302, the “red flag” gun bill. Jim Mathias may have always intended to vote the correct way, but the 22-day hiatus between Mary Beth’s vote and Jim’s tally was punctuated with a loud outcry from the 2A community that Mathias had to hear. [However, despite the NRA support Mathias joined Carozza on a vaguely-written ban (HB888/SB707) of so-called “bump stocks.”] Jim’s only other instance of getting a vote correct (a term-low 2 correct out of 25 votes) was sustaining the veto for HB694 – but that was the “ban the box” bill he originally voted for! Is it any wonder that people like me can be cynical about Jim’s record? A major bill that the pair parted ways on will also be decided in this election – same-day voter registration is already in place during early voting, but HB532 established a referendum for this year that mandates its inclusion on Election Day, presumably beginning in 2020. Jim Mathias may not mind this extra work for poll workers and increased risk of voter fraud, but Mary Beth stood against it. The Big Labor interests that have supported Jim Mathias to the tune of tens of thousands of dollars over the last twelve years got their money’s worth this term – bills that dealt with making new hires opt out of being harassed to join the union rather than having to opt in (HB1017/SB677), another allowing disgruntled employees disputing prevailing wage decisions being allowed to take their suit directly to court (rather than to a state arbitrator, part of HB1243/SB572), and a huge gift as the precedent was set (with Jim’s support) for paid parental leave in SB859. This was on top of getting the veto override of HB1 from 2017, in part thanks to Mathias. Mary Beth stood with providers by opposing a bill written by the insurance companies (HB1782) establishing a re-insurance program through a renewed assessment (formerly on a federal level, but being shifted to a state one) on those same insurers. Jim Mathias obviously isn’t into fee relief. Finally on the environmental front, Mary Beth was on the right side of a proposal (HB1350/SB1006) that mandates certain state-funded construction projects be adapted to conform with weather conditions brought on by supposed global climate change. It may be prudent in some instances, but will certainly bust the budget elsewhere. Because District 38 is my home district, I have been paying particular attention to the race. But it’s worth noting that a similar race exists in Senate District 8 which pits Senator Katherine Klausmeyer against Delegate Christian Miele. While the differences aren’t as stark between those two as they’ve been between Carozza and Mathias, they are still there: over the last four years where they have served together, Klausmeyer has racked up annual mAP scores of 32, 2, 24, and 4 for an average of 15.5, while Miele has scored 58, 44, 60, and 26 for an average of 47. On the average, then, Miele would get 7 to 8 more mAP votes correct than Klausmeyer each term, which can mean more money in your pocket and more opportunity for businesses to thrive and create good-paying jobs. The records are there for inspection on the sidebar. One final word. We can talk about voting records all day, but there are those who swear by Jim Mathias because he “works hard for the district” or some variation of that remark. As proof they can point to social media, where Jim is often going live at some event or gathering – even if it’s walking in a parade 100 miles outside his district. Look, I’m into hometown pride as much as anyone given my affinity for particular sports teams and number of my friends still hailing from mine, but the whole “look at me” attitude seems a little artificial and contrived after awhile. I noted four years ago that many of Mary Beth’s former cohorts provided the seed money for her campaign, but in this round it’s become far more local as she has gained the confidence of those who donated to her. Mary Beth wasn’t someone I knew well prior to her 2014 campaign: I met her years ago when she worked for the Ehrlich administration, but it’s not like our paths crossed a lot. One thing I’ve noticed as she’s run her two campaigns, though: that woman is everywhere. But she isn’t one to plaster it all over social media, opting to be more of the work horse than the show horse. Maybe that costs her a few votes among those who like glamour and popularity, but the thoughtful voters notice. I saw Jim on Sunday at the Autumn Wine Festival, just as Kim and I were leaving. While he probably shook more than a few hands while he was there, the reason he came was to sing with the band that was playing to close out the event – more on that band in a future post. It’s nothing new, as Jim has sung with On The Edge before at the AWF and, in general, has been around the local music scene as long as I’ve been aware of it. Obviously that’s something he enjoys doing, and I don’t see a thing wrong with that – in fact, I wouldn’t mind him having more time to sing after this November. In short, the reason I’ve been on this race so much and for so long is that I think Jim’s a fine enough and likable fellow, but is also a political mismatch as a representative of this district – he seems to be much more suited for a district across the bridge, a place from where a significant portion of his financial support comes. Here we have a district that is much more right of center than he is. So while she’s not as far to the right as I would prefer, I think that in order to make a better team for local success throughout District 38 we need to promote Mary Beth Carozza to be our next State Senator. I urge you to vote accordingly, whether at early voting beginning tomorrow and running through next Thursday or on the traditional November 6 date.